A cargo plane emblazoned with "Prime Air" descended from an empty sky at Lehigh Valley International Airport on Tuesday, ninety minutes from the bustle of New York City, loaded with crates of goods during the peak holiday shopping season. It's one of 40 jets leased by Amazon.com Inc. for a new cargo service to meet delivery demand from the retail giant's customers. Exclusive payload data reviewed by Reuters and interviews with airport officials around the country show that Prime Air planes are flying nearly full, but with lightweight loads, taking away valued business from FedEx Corp. and United Parcel Service Inc. Expanding into transportation, from trucks to planes, is one of Amazon's most important endeavors as it strives to lure new customers with fast shipping while keeping costs under control. The world's largest online retailer is sending more packages, more often, and later in the day to serve its estimated 35 million to more than 50 million U.S. members of Amazon Prime, a service that promises two-day shipping for $99 per year. Bulky boxes with goods once purchased in stores, like toilet paper, are a revenue driver at UPS and FedEx. That's in part because they now are charging customers increasingly by boxes' volume rather than weight. Shipping its own big, light packages is helping Amazon dodge those rising fees. To date, Amazon has only said it leased the planes to speed up shipping and to backstop cargo partners during the holiday season. FedEx and UPS have delivered items late for Christmas in recent years. "Our own delivery efforts are needed to supplement that capacity rather than replace it," Amazon spokeswoman Kelly Cheeseman told Reuters. She declined to comment on eluding cargo airline fees. Amazon's planes fly to at least 10 airports across the United States, supplying its warehouses nearby. Officials at four airports said Amazon's flights are operating near capacity but landing with lower-than-average weight -- meaning it is placing low-density shipments inside the jets. Amazon aircraft on a monthly basis handled only between 37 percent and 52 percent of their maximum loads by weight, according to an analysis of cargo, capacity and landing data from the four airports, with supplementary information from tracking website FlightAware.com. By contrast, FedEx and UPS were at 53 percent and 56 percent capacity, respectively, according to U.S. Transportation Department data for the year ended September 2016, excluding weight carried for free. "You're dealing with cargo that's big in dimensions, but in pure weight it's light," said an airport ramp manager in California. Airports in Tampa and Charlotte reported similar payload data for the carriers contracted by Amazon, but they did not specify whether the flights were full by volume or whether they were operated on Amazon's behalf. A seventh airport outside Chicago said the planes were not full, though daily flights only started in October 2016, and Amazon likely is learning the market, transport experts said. The remaining airports did not comment. FedEx declined to comment. Steve Gaut, vice president of public relations at UPS, declined to comment on Amazon's airline but said customers commonly handle parts of their logistics in-house. Reuters could not determine the extent to which, if any, Prime Air had an effect on the bottom lines of FedEx or UPS to date. Reuters could also not determine how much Amazon has spent on aircraft leases so far, key to whether the fleet has cut its costs overall. The payload figures Reuters reviewed do not include November or December, when contractor ABX Air, a unit of Air Transport Services Group Inc., paused flights for Amazon after a pilot strike. 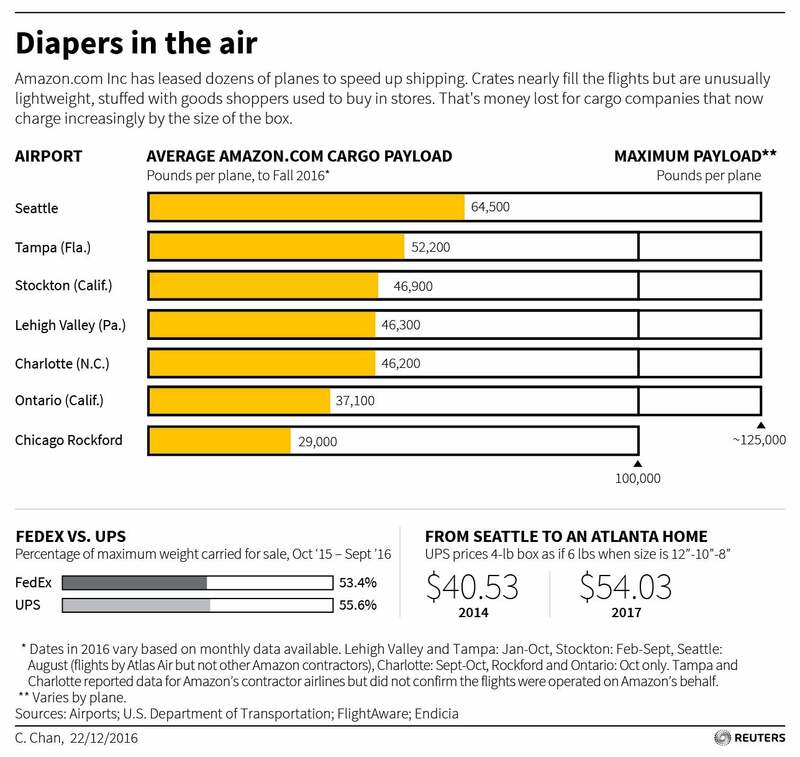 Flight data shows another way that Amazon is departing from cargo companies' road map in an attempt of its top goal: rapid delivery. Using FlightAware.com and similar websites, Reuters tracked the schedules of Amazon contractors and verified with airports which flights were on behalf of the retailer. Many of the company's eastbound flights leave the states of Washington and California unusually late at night: its flight from Stockton to Wilmington, Ohio departs close to 2:00 AM Pacific Time (10:00 GMT), for instance. FedEx instead schedules most eastbound service no later than 9:00 PM (5:00 GMT) to ensure arrival at its Memphis, Tenn. hub in time for sorting packages overnight. The difference is that cargo airlines stop at airport hubs so they can fill up planes easily with boxes from many origins. Amazon does this much less. But flying without a stopover is faster, helping Amazon cut shipping times from Prime's two-day standard, to a day or even hours. Scheduling later departures has an advantage, too. "Most people have a tendency to order packages when they're home" from work, said Brian Clancy, managing director of advisory firm Logistics Capital & Strategy LLC. Amazon is "waiting for the orders." Amazon also saves time by flying to remote locations like Lehigh Valley, which are near cities and its warehouses but have little traffic. Expectations are for Amazon to stretch well beyond Lehigh Valley and the existing airports Prime Air serves. "We're just seeing the beginning of this," said Marc Wulfraat, president of logistics consultancy MWPVL International Inc. "We could see Toronto. We could see Denver. They're going to need a lot more planes," he said.